With a wealth of entertaining and engaging comic collections and original graphic novels debuting almost every week, it’s become far too easy to ignore the reappearance of older material, no matter what its pedigree. Add in the increased pace of modern life, coupled with an almost obsessive need for the Next Big Thing, and it seems all but inevitable that even truly exceptional work is destined to be overlooked, lost, or all-but-forgotten in the mental din created by information overload. Still, the pleasures afforded by the best of these re-released titles remain undiminished by the passage of time or lack of continued attention. Like all modern classics, these volumes readily prove themselves worthy of re-reading and renewed critical notice. 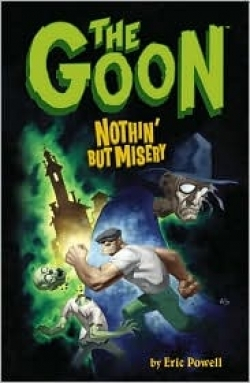 This month, the astute reader searching for a perfect example of books in this category need look no further than Eric Powell’s The Goon vol. 1: Nothin’ But Misery. This sardonic, darkly humorous collection blends an inverted Horatio Alger tale with a rich mixture of Sci-Fi, horror, Noir, and other diverse influences to create a reading experience quite unlike anything else out there. The titular character is a battle scarred, bulky behemoth with an overbite as prominent as his brow and the bill of his cap. Accompanied by his ever-present sidekick Franky, the Goon patrols the streets of an unnamed burg, protecting those citizens who pay his long-absent boss protection money. And while the dangers are many and varied, chief among them is the army of undead commanded by the Zombie Priest without a name, a ravenous force that occupies all territory beyond Lonely Street. As the preceding hints, this chimerical series borrows freely from all aspects of pop culture. What it doesn’t indicate is that The Goon is a beautifully drawn, perfectly executed thrill ride that remains fresh even after multiple re-readings. Powell is a consummate draftsman, in complete control of both his tools and the medium itself. A gifted storyteller, he’s also possessed of an impeccable sense of pacing and pitch-perfect comedic timing. Better yet, Powell remains wholly capable of achieving startling and emotionally telling moments that illuminate hidden aspects of his leading and secondary characters with but a few words or the deft stroke of a pen. Fun, irreverent, and packing more laugh-out-loud moments than almost all other overtly comedic titles on the shelves, The Goon vol. 1: Nothing But Misery offers anything but a dreary reading experience.